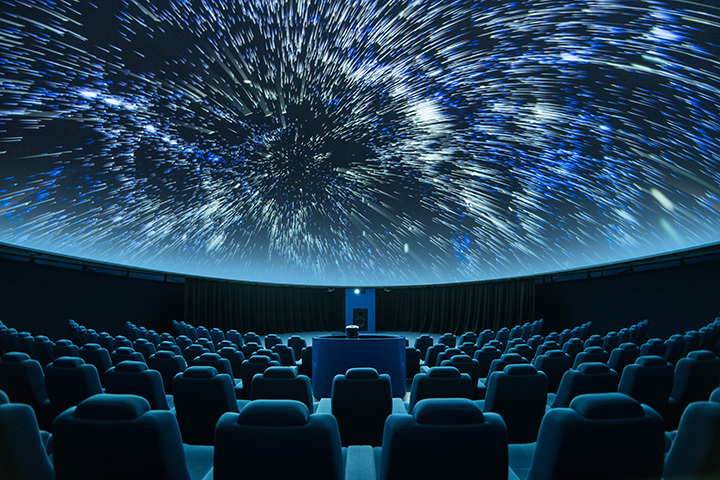 Abrams Planetarium opened its doors for the first time in 1963, and for the past forty years it has continued to excite and inspire both young and old. The planetarium is named for Talbert "Ted" Abrams and his wife Leota. Ted Abrams was a leader in the field of aerial photography and during the early 1960's he and his wife contributed a sizable amount to Michigan State University in order to build a center of space science education. The original building was designed by Ralph Calder Associates of Detroit. It featured a 60-foot copper dome surrounded by a one-story windowless brick building, in a full Flemish bond. In 1995, windows were added to give it more character. The building consists of three primary sections: the Exhibit Hall, the Blacklight Gallery, and the Sky Theater. Each part of the building has been renovated since its original construction, with each change representing an improvement in technology and scientific knowledge.